In a rare move, the Labour Party announced last week that it would co-sponsor the Green Party’s Waste Reduction Bill. A RECYCLING DEPOSIT scheme for plastic, glass bottles and cans is estimated to cost around €120 million, according to government sources. In a rare move, the Labour Party announced last week that it would co-sponsor the Green Party’s Waste Reduction Bill, allowing the Bill to proceed in their Private Members’ slot this afternoon. The bill has two main aspects. One is introducing a recycling deposit scheme for plastic bottles, glass bottles and cans. The other is banning single-use, non-compostable plastics such as coffee cups. The proposals would see consumers able to avail of a 10c refund if they bring back their plastic bottle, glass bottle or can. However, government officials argue it will be the customer that ends up paying, with the estimated set-up and operating costs of such a scheme coming in at €120 million. Speaking about the Bill in the Dáil last month, Green Party leader Eamon Ryan agreed that it would come at a cost, stating that he believed the 10 cent deposit return would cost approximately €276 million. However Ryan said funding for the scheme could be charged to the manufacturers. “This costs the Exchequer nothing. It benefits the consumer and it benefits in terms of savings from lower landfill costs and higher effective recycling,” he said. In the last number of years, the government said it has investigated if such a scheme would work in Ireland. Two recent independent reports which looked at the feasibility of a deposit and return scheme in Ireland were carried out in 2009 and 2014, with both concluding the cost would outweigh the benefits. The Department of Communications, Climate Action and Environment states that a 2009 report, commissioned by the then Environment Minister, John Gormely, said the evidence was not sufficiently strong to support such a scheme “because the information regarding implementation costs is not such that the costs can be said to unequivocally justify the benefits”. However, Ryan argued there are multiple advantages for such a system. According to the most recent Coastwatch survey, drinks container litter is the most widespread and frequent shore litter in Ireland, he said. 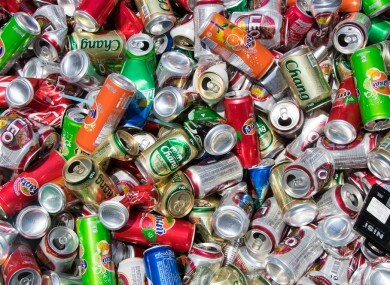 In other jurisdictions, such as the Netherlands, Sweden and Finland, that operate such schemes, the rates of recycling for these products are in the 90%+ range. Department officials argue it would also not have a huge impact on recycling or litter rates due to Ireland already being having one of the highest recycling rates for drinks containers in Europe, with 86% of all glass being recovered and recycled. However, Ryan cited reports, such as the EPA’s Waste Packaging Statistics for 2013, which shows only 40% of plastic packaging was recycled. The Bill appears to have cross-party support, with Fianna Fáil also expected to back it this week. “I think we have the numbers to get it through. Politics is a numbers game and with ourselves, and Labour, with Sinn Féin and Fianna Fáil and with the Independents 4 Change all indicating that they’ll support the Bill, it looks like it is going to get through,” Ryan told reporters today. “It is a great victory for the environmental movement… this is climate bill as much as anything else,” he added, stating that it will encourage people to recycle. Ryan said he is happy for his Bill to proceed to Second Stage this evening, and then to draft a report to send to Joint Committee on Communications, Climate Action and Environment, which will set out, in detail, the specific legislation that is needed to make his idea a reality. This will ensure it is “done in a way that is good for politics, with the parties working together. That is what people want to see”. “Labour is happy to co-sponsor this important legislation from our progressive colleagues in the Green Party because it makes sense,” said Labour leader Brendan Howlin. Asked about the costs, Howlin told TheJournal.ie last week that using administrative costs as a reason to not introduce the scheme was just an excuse levelled by government. I worked five years in the Department of Public Expenditure and Reform and that is the constant first script that is dusted down. I think I have used it myself more than once. ‘It’s administratively costly’ – it’s a great thing, it’s like apportioned administration, it is a phrase that very few people understand, but it is always used simply to put down a good idea. If it is not effective, why is it the norm in most other progressive European countries? We are not so unique that we are different from the Germanys, the Swedens, the Denmarks. A statement from the department said the Minister for Communications, Climate Action and Environment, Denis Naughten, is “gravely concerned” at the amount of plastic waste pollution. Deputy Ryan has indicated, when introducing the Bill, that the scheme would cost approximately €276 million to operate in Ireland. A study investigating the possible introduction of a UK-wide deposit and return scheme reported that it could cost in the region of €790 million (£700 million) per annum. Due to the lack of clarity about the potential costs on taxpayers, consumers or industry and in the absence of any assessment of the regulatory impact or effect on prices, it is understood that, subject to Cabinet approval this morning, Naughten is to table what the department describes as a “timed and reasoned” amendment to the motion, which would allow for pre-legislative scrutiny of the Bill between now and the end of the year. If accepted, it is envisaged the Joint Committee on Communications, Climate Action and Environment will consider submissions and hold hearings in relation to the proposal to ensure that the Bill does not give rise to any significant additional costs on the Exchequer and the consumer. TheJournal.ie has also learned that Retail Ireland has expressed concerns about the new Bill, who stated that recycling rates have improved due to efforts coordinated through the Repak organisation, which is in part funded by the members of Retail Ireland. Repak is a not for profit company set up by Irish business and owned by its members. It charges fees to its members and these fees are used to subsidise the collection and recovery of waste packaging through registered recovery operators across Ireland. It’s understood retailers are concerned at the potential costs attached to the development of such a scheme. Retail Ireland also said it is concerned that the development of a new system”will merely undermine the good work done to date by the Repak organisation to bring Ireland from having one of the worst rates of recycling in Europe back in the late 1990s of around 15% of all packaging material recycled, to amongst the best today”. Contrary to the stated aim of this measure, deposit return schemes do not fix litter problems, added the group, who said drinks containers currently account for less than 5% of street litter. Email “Scheme to give you 10c back for each bottle and can could cost €120m to roll-out”. Feedback on “Scheme to give you 10c back for each bottle and can could cost €120m to roll-out”.